This post about Mediterranean Tri Pepper Pasta Recipe is brought to you thru my relationship with Dreamfields Pasta. All opinions are 100% my own. Did you know October was National Pasta Month? Considering that our family has pasta at least once a week, it was a natural for me to celebrate. Pasta is so simple to make and pair with a sauce and veggies. We actually have “gravy” wars between my husband, my son and I, as to who can make the best sauce! 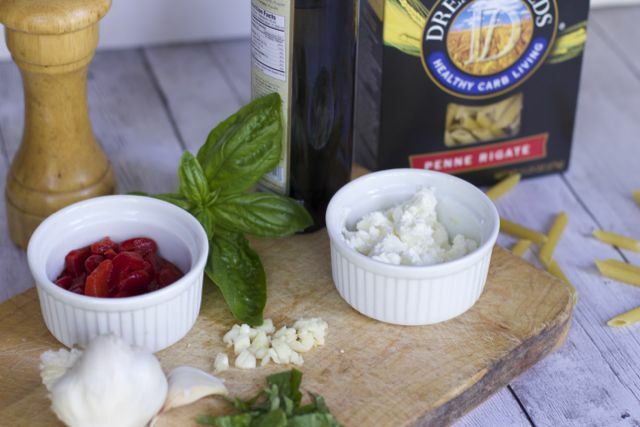 While our family loves the traditional pasta sauce, this mom sometimes needs a no cook recipe that she can throw together with simple pantry items. So when Dreamfields called and asked if I’d like to participate in their #HealthyPastaMonth promotion with a quick and easy recipe, I jumped at the chance. 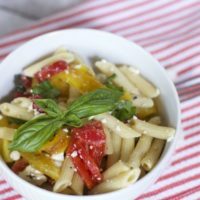 This Mediterranean Tri-Pepper Pasta Recipe fits that criteria, plus it tastes great hot or cold. 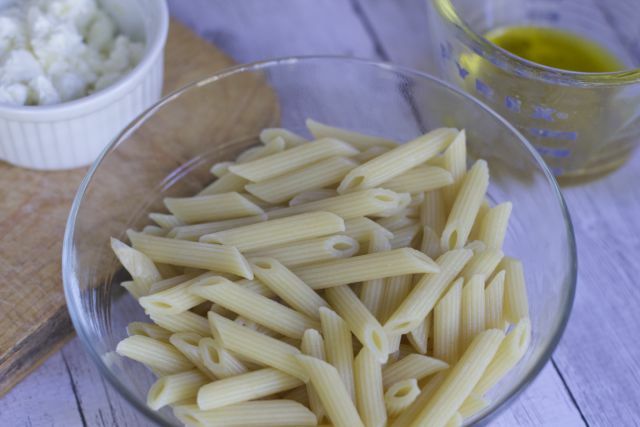 We used Dreamfields Penne Rigate but any type of pasta shape will be just as tasty. We also roasted our own yellow pepper for this recipe but if you can find jarred red and yellow roasted peppers, this makes the recipe that much easier. My grandmother and mother used to roast peppers right on top of their gas stoves. You can roast the peppers in the oven if you are doing a bunch but for this recipe, we just needed to roast one yellow pepper and this is quick and easy. Simply place your washed and dried sweet pepper over the gas flame. When a side gets a nice charring on it, simply rotate the pepper until it is completely charred on all sides. 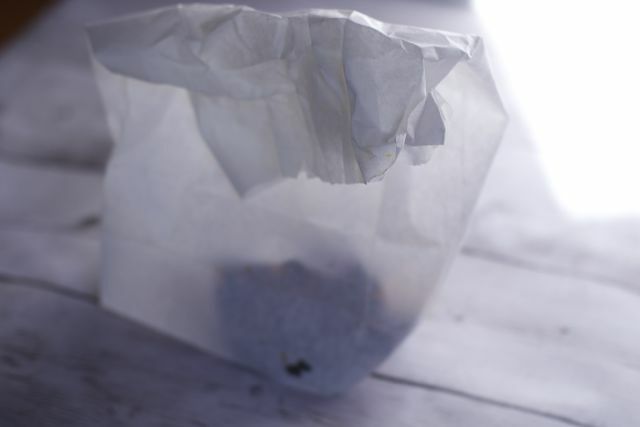 Simply place the charred pepper in a paper bag and allow the pepper to steam. I waited about 15-2o minutes. When the pepper is cool enough to touch, simply peel off the charred skin and you have a freshly roasted pepper. Meanwhile, boil your Dreamfields pasta per the package directions. 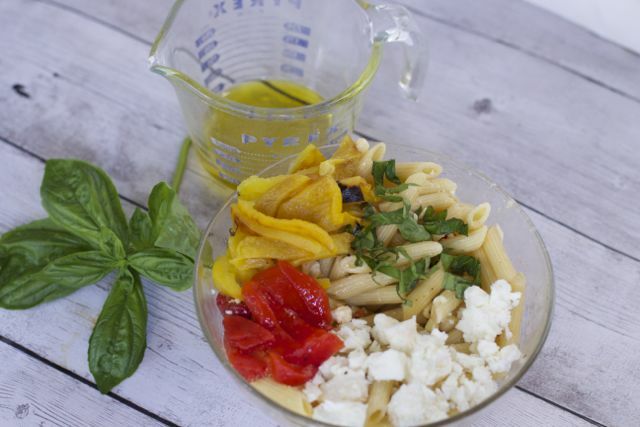 Then start adding the yummy Mediterranean flavors of feta, olive oil and basil. This is a dump and go recipe, proving to be the perfect weeknight dinner. I am just loving the flavors of this dish, and it is even better the next day. 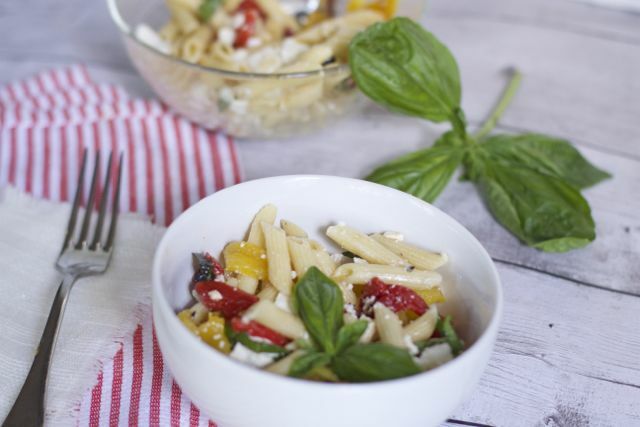 Fill your bowl with this amazing Mediterranean Tri Pepper Pasta Recipe and save the rest for lunch the next day. Have you tried Dreamfields pasta yet? Dreamfields is made with premium durum wheat semolina in North America. That’s why it has the same delicious taste and texture of traditional pasta. Did you know that a one-cup cooked serving of Dreamfields pasta (2 oz. dry) provides 5 grams of fiber and 7 grams of protein! Don’t tell your family or they might be suspicious! I want you all to get excited about this pasta recipe by giving one lucky ready a case of Dreamfields Pasta. To win, tell me what your favorite #HealthyPastaMonth recipe is to date (other than mine, of course) on the Rafflecopter entry below! Good luck! 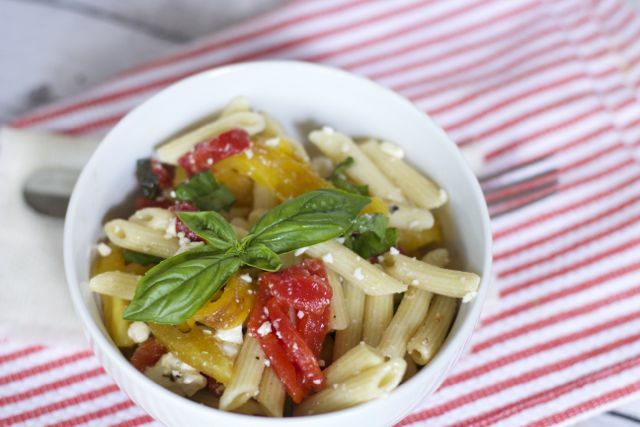 A wonderful MEDITERRANEAN PEPPER PASTA filled with three peppers, feta and basil. Prepare pasta according to package directions. Return to pan. Add peppers, feta cheese, basil, garlic and ground pepper; toss to combine. Drizzle with olive oil; a tablespoon at a time, tossing until pasta is coated as desired. Note: Homemade roasted peppers can be substituted for jarred. Rotini with Rosemary Pesto! Sounds amazing! Let’s try the Stovetop Smokes Ham pasta. The Blackened Shrimp pasta looks awesome!! My husband makes a pesto cavatappi that is absolutely phenomenal! Yesterday’s recipe was artichoke, walnut, and prosciutto angel hair… yum! Chicken Taco Pasta. It looks good too. Favorite recipe to date is Spaghetti Pad Thai, I love the mix of Italian and Thai cuisines! Yesterday’s recipe: Lasagna Soup, yum! red sauce with pasta clams. The Blackened Shrimp Pasta sounds amazing. Yesterday was the Rotini with Seared Shrimp and Avocado-Chimichurri Sauce. Yesterday’s recipe was Chicken Taco Pasta! The recipe featured yesterday was Tomato, white bean and garlic sauce. 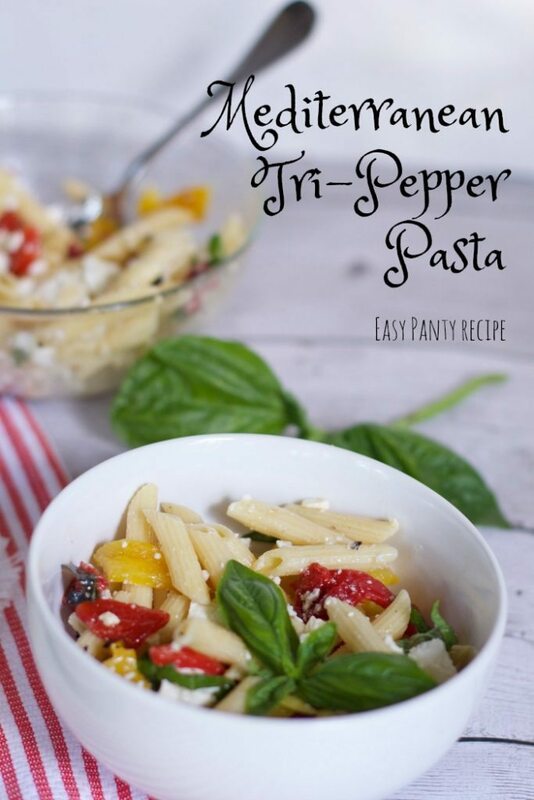 The Mediterranean Tri Pepper Pasta which sounds really yummy! Yesterday was the Mediterranean Tri-Pepper pasta. Yum! Mediterranean Tri-Pepper Pasta was yesterday’s recipe. Yum! I like the Linguine with Tomato, White Bean & Garlic Sauce. Rotini with Seared Shrimp and Avocado-Chimichurri Sauce. 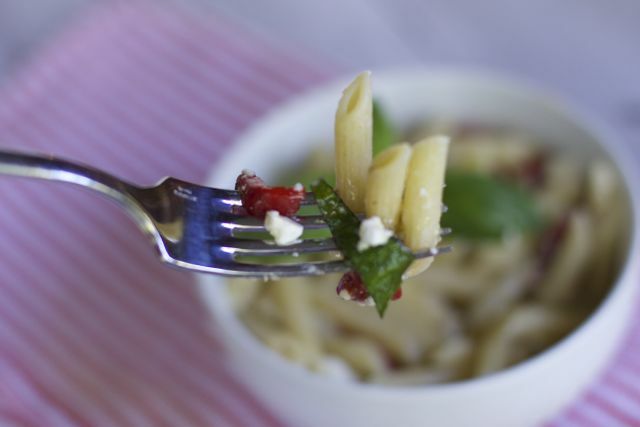 The featured recipe today is the Mixed Greens Rotini with Feta and Roasted Tomatoes. Your recipe looks so easy and delicious! I can’t wait to try it! Spaghetti pad Thai is my fave to date! I like the dish, easy to make and I love feta cheese! Yesterdays recipe was SPAGHETTI PEANUT PAD THAI! October 11 was Mediterranean Tri Pepper Pasta. 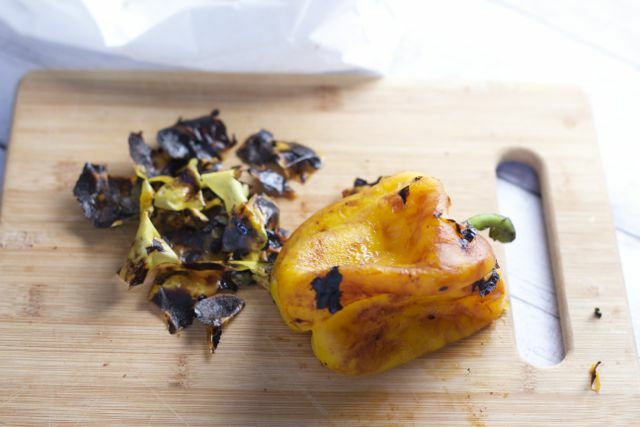 Roasting peppers is a fantastic way to bring out yummy, deep pepper flavors. Mediterranean Pepper Pasta was the recipe on the 11th. MEDITERRANIAN TRI PEPPER PASTA WAS FEATURED YESTERDAY, WHICH WAS TUESDAY, OCTOBER 11, 2016. My favorite recipe so far is pasta with broccoli and pine nuts. Yesterday’s (Tuesday’s) recipe was your recipe, the Tri-Pepper Pasta. The day before was Spaghetti Pad Thai. Thank you for sharing your traditions as well. In this particular brand there is. 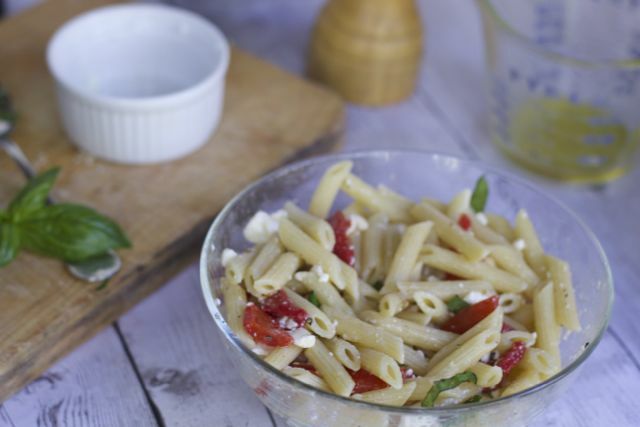 The recipe for yesterday was Mediterranean Pepper Pasta! Looks great!! The recipe for yesterday, Tuesday, was Mediterranean Pepper Pasta. This looks delicious! I’m a big fan of pasta. I didn’t know there was protein in it though! I use their pasta all the time actually! I like your roasted pepper steaming trick. Very cool! I love the #HealthyPastaMonth Angel Hair with Chicken Scampi!! Spaghetti Pad Thai is #10, that is yesterday. Looks so good! Spaghettti Pad Thai is yesterday’s recipe. Love pasta recipes! i lvoe me a good pasta dish. i want to try the angel hair and tomato toss for something light and easy. The recipe looks delicious. 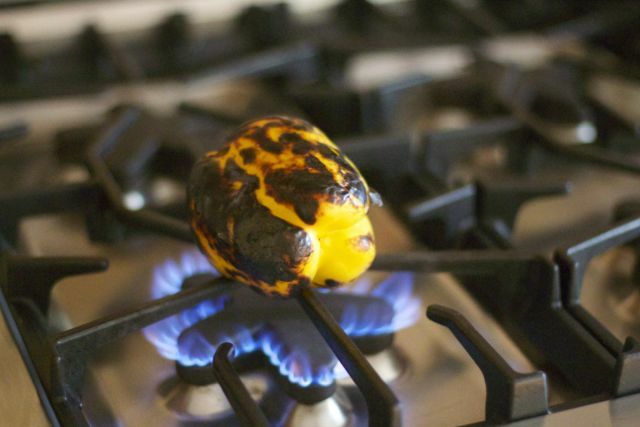 We make something similar with peppers, but I had no idea you could roast them right on the burner!